I love getting mail, like absolutely love getting mail. Even though half the time, ok more like all of the time, the things that I am getting are things that I've ordered for myself, which is why it makes getting this piece of mail all that more exciting. Yes I did order it for myself, but I have no idea what will be inside! It's my FabFitFun VIP Box! After the success of my very first subscription box (you can read about it here) I figured I would keep going. What I like about FabFitFun VIP is that it is a seasonal box, as opposed to monthly, and it includes full size products. Both times now my boxes have been full with over $200 worth of product, which is awesome considering I'm spending under $50, and it exposes me to some great products I most likely wouldn't have otherwise tried. It also dosen't hurt that it's curated by Giuliana Rancic who is adorable and has great style. Check out what I got in my Summer Edition VIP Box. Sonya Dakar Flash Facial| I was probably the most excited about this item out of everything in the box. It claimed to reveal softer, plumper, and younger looking skin in just 60 seconds, and it retails for $95. I will take better looking skin any day, I just usually wouldn't pay that much for it! I've only used it once and so far I've liked it. You can definitely tell it's sloughing off the dead skin cells and I felt it did leave me with a refreshed look. I'll be curious after a couple uses if I notice a big difference. Pur~lisse Pur~protect SPF 30| I'm excited to give this lightweight moitsurizer a try, not only does it have natural ingredients it was also recently featured in Vogue as the Editor's Favorite Summer Product. Thursday Friday Away Mini Clutch/Makeup Bag| This is a cute little bag that is fully lined, easy to throw make up in. You can never have to many of these little cases around, they are especially great when traveling. Balanced Guru No Frizz Oil| Super excited to try this hair oil, it's organic, cruelty free, and help combat frizz, which is always bad in the summer, especially for us curly haired girls. This is a blend of argan, jojoba, and tamanu oils to help tame the crazy flyaways. FabFitFun Water Infuser| This is a BPA free bottle with an infuser, so you can add natural flavors to your water, which is great for me, because sometimes I need a little help to drink as much water as I should. I'm sure I will put this to use. Zoya Nail Polish| You can never have too much nail polish and I love this bright coral color I received called Thandie. Next polish change this will be going on my toes. Kisstixx Lip Balm| The idea is 2 lip balms with compatible flavors that combine when you kiss. I got chocolate and strawberry, could be interesting. That is what I consider the good bulk of the box, but there were still several more smaller items in there. There was a bag of POP Chips, Skintimate Shave Gel, Always Extra Protection Liners, and a Slimfast Meal Bar. All in all, TONS of stuff. 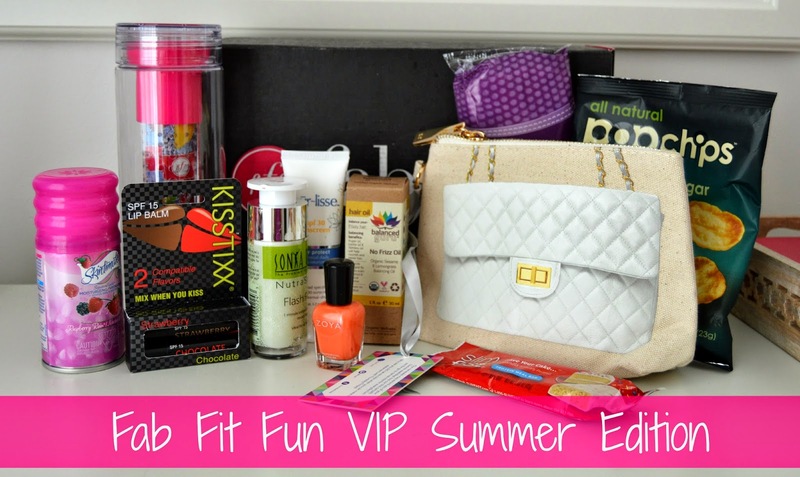 Would you like to score yourself a FabFitFun VIP Summer Edition Box?! They are still available to order and I have a coupon code good for $15 off your box, just imagine you could have all that listed above for $35, how awesome is that?! The first 3 people to redeem this code, it's all yours! 8000724, use that number, go to town. Even if it's used up I still think the box is a great deal, at $49.99 you get tons of great product, that's what I paid for mine and I think it's well worth it! Go here to snag one of your own! This box seems like such a great value! I mean, geez - look at everything you got! I'll have to check it out. Love your reviews of everything! You should totally check it out! I think I like this more than if I got a box that came every month with samples of products, and they are pretty great products!